This is a non – invasive, safe, but, pregnancy/ pacemaker contraindicated therapy . It works, with the therapist facilitating the application of a microcurrent (millionth of amp )to a body part or organ, this, through conductive receptive, graphite gloves, so placed, as to create a positive to negative “field” which also receives specific frequencies, that resonate with, and normalise its targeted tissue. The recipient should start therapy well hydrated to enhance conduction. You have heard it said if you leave clothes long enough in the wardrobe they will eventually come back into fashion. Designers of a later era, will put their own individual expression of how to relaunch the garments of the past, this, using updated techniques of cutting, colouring, and of course the mandatory stand out “label” that brings it to the latest catwalk. Frequency Specific Microcurrent (F.S.M.) also has such a history. The past is not without its successes, this, in exploration, architecture, art , and most certainly, in medical advancement. Some years back while I was training at the National Training Centre (N.T.C.) there was an addition to the courses on offer to graduates, this was to be my first introduction to F.S.M. The course quickly gathered interest as the college was for the first time in it’s existence endorsing a “ machine”, to this point it had confided it’s approach solely, to hands on methods of treating muscular disorders. If the founder of the N.T.C, and accomplished anatomist Mr John Sharkey was convinced of the worthiness of F.S.M, then I wanted to up skill on this unknown mode of treating at cell level. The tutor for this course was flown in from the U.S.A. Dr Carolyn McMakin, she gave account of her coming into possession of the so to speak” clothes in the wardrobe”, frequency’s used in past years which had been set aside as medicine then favouring to follow the cutting open of people on the operating table, a trend we are now trying to avoid at all costs nowadays. 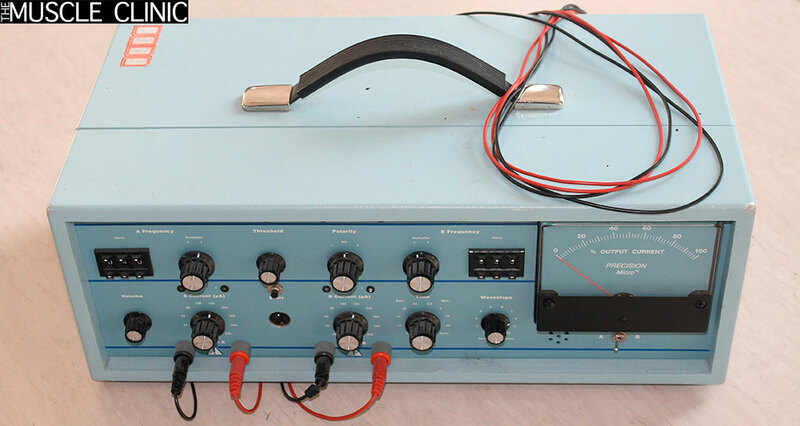 So, this is no new therapy, its roots firmly in the past, where, Mr and Mrs public would have had a raw grounding in the understanding of this electro effect on the body as they were introduced to Mr Frankenstein, and the shocking treatment of “shock therapy”. Thankfully on my introductory course Dr McMakin was educating on the”revised” electro effect , fit for purpose, catwalk version of the Frequency Specific Microcurrent. The old frequency’s had under gone extensive re-testing, and many new frequencies established during this process. You can’t live on planet earth without getting the idea that money is the currency of the world, well, the body has its own such currency, Adenosine Triphosphate (A.T.P.). This energy is produced in every cell of the body, in a factory called the mitochondria, and the wonderful thing is, the use of F.S.M. is clinically proven to boost the production of this energy by a whopping 500%.o. The body without doubt is its own physician, cut your finger and it will use its inbuilt intelligence to promote the healing process. Sprain an ankle, or tear a muscle, this same intelligence will set about. The repairing of the trauma. We, can work with, or against the body’s intelligence, this, in a positive way by following learned protocols, these established having observed the natural healing processes of the body. Working against this inbuilt intelligence is firstly, displaying the lack of same, and secondly putting a full recovery from any illness or injury at risk, or indeed the maintenance of full health. The ability of F.S.M to boost the ATP of the mitochondria is certainly a” positive” in working with this inbuilt intelligence of the body. F.S.M. does not present itself as a cure per se but rather acts a substantial support to enabling the body go about what it does naturally, SELF HEALING. Using F.S.M produces variables in it’s results, from the number of treatments a person requires, to the degree of improvement, and then, the duration that these improvements last, from hours, to, days, months, or a permanent solution. Why this is, we wait on future scientific information, but variables are not restricted to this therapy alone, the most established injection clinics, medications , operations, are constantly left searching out reasons for their varied results in these medical interventions. A major difference in favour of F.S.M thearpy is,” RISK FACTOR”, the good news here, is, there is none. In addition to the exterior variables cited above, a further variable, but this one of an intracellular kind, and a strong contender as to why there are these exterior variables in the results. The factory inside every cell of the body (mitochondria) the one that makes this critically important ATP that energises the body, well, there is substantial evidence to suggest that it is working well below capacity in great numbers of people.